RAISE UR PAW NEWS: Does BSL (Breed Specific Legislation) Really Work?? You Be The Judge! Does BSL (Breed Specific Legislation) Really Work?? You Be The Judge! Although we are observing more bans occurring on innocent breeds, "pitbulls" mostly, and more places jumping onto the bandwagons for BSL (Breed Specific Legislation), like Montreal previously did, there is still that whole question that looms within the air, Does BSL really work? will it truly be effective? or is it simply a reaction to make people believe that they will be safe from dog attacks/bites by canine breeds. When it comes to such dilemmas like dog attacks, in which a person is either injured or killed, it increases the instant reaction that communities must be protected from dangerous animals, and thus leads Governments and Public Officials to adopt or consider BSL (Breed Specific Legislation) as a possible, and easy solution to making society feel safe, whether or not the proof is there that such a method or strategy actually works. We must understand and acknowledge that the BSL (Breed Specific Legislation) is basically a discrimination against a breed of dog, and applies such racial and unfair profiling towards that certain breed, even if the canine is a threat or danger to the community or not. It is due to this discrimination that punishes and forces unfair restrictions and regulations not only on the breed of dog in which the legislation is applied too, but also the responsible owners of such canines as well, and basically doesn't hold irresponsible owners accountable for their actions or roles. But how effective is BSL really? ... well according to much research, it seems that countless countries etc who have already put BSL into effect, are actually now re-examining and in some cases repealing the applied legislation due to the recognition of existing problems and issues that go hand in hand with Breed Specific Legislation.. and these are only a few: BSL leads to increased costs to the community, causes issues with responsible dog owners due to being punished & forced to comply with unfair regulations of this legislation, forces irresponsible owners to choose other breeds (forcing officials to continue to apply other breeds to the BSL list), re-educating enforcement officers to properly identify & basically become experts on breeds, forcing individuals to leave communities in order to keep their "fur-family" members, and no evidence of decreasing animal attacks/injuries or other improvement once the ban has been put into effect etc. If by chance that a community, or society want to find suitable and appropriate solution to the problems in which they are faced with when it comes to "dangerous dog" incidents, then the very first thing that must be done... is rethink and drop the idea of a possible breed specific legislation... it just doesn't work & is not the answer they are wanting to solve this dilemma. What must be done and very imperative, is a complete address upon the matters at hand and find alternative strategies without having to put targets upon the backs of innocent canines. Such an address of this concern, should immediately and foremost be put toward the concern of irresponsible ownership - an effective method of animal control, once this has been established and brought to the table, development of policies that deal with these forms of incidents and with "dangerous dogs" can help in order to protect community citizens, and by developing strict animal control enforcement methods and definition of threatening behaviors within all breeds. Doing just these few things give a fair process and measurable actions that will not discriminate against any specific breed, will not lead to the murder of countless innocent lives or punish responsible owners or breeds, and it will create a more effective solution then what the BSL has to offer. 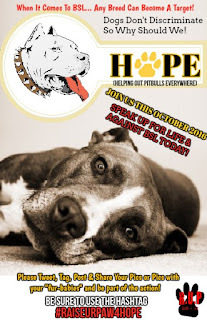 JOIN TODAY FOR H.O.P.E (Helping Out Pitbulls Everywhere) --- October 2016, Pitbull Awareness Month #RaiseUrPaw4Hope. 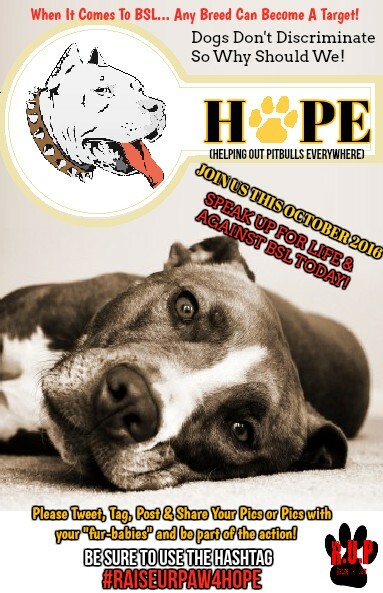 Spread the Message, Raise Ur Voice Against BSL, and Make A Stand For Pitbulls Worldwide.